Just before the start of any long holiday or a school-break, I often hear mums complaining about how they have a long holiday ahead and how difficult it would be to keep the kids busy and occupied. At the end of the holidays however when we are back to school it comes as no surprise to me when the same mums start complaining that the holidays were too short! But that is so true for our last holiday in Mumbai. Just before I left I wasn’t sure if I had made the right decision of deciding to spend 6 weeks there. 6 long weeks in the peak of the monsoon season in Mumbai where – rains lash down for days together and where water-logging becomes a part of life. It is also the time when most children have their mid-term assessments in school, giving them no time for play, that meant less socialising for my kids. To add to that I was doing this trip without my husband, which meant that I was solely responsible for taking care of my boys, planning their activities and entertainment. But at the same time I had some firm objectives about what I wanted to achieve out of this trip – I wanted my children to know their extended family, I wanted them to feel like a part of the family, to play with their cousins, to visit their relatives, to experience living in their home town, to hear and try to speak their own language, to learn more about their traditions and customs. Most of all I think I wanted to share with them my life growing up in that city. I wanted my boys to know what life was like for his mother as a child their age. Keeping this agenda and 6 long weeks in mind, I took no time in fixing up a schedule for my elder one – football classes, Hindi language class, religion and prayer class all fell into place and I was lucky to find the right kind of teachers who taught with the sole interest of educating a young life. Besides the classes I kept them busy taking them for playdates with my own school friends’ children, watching movies and we even got the opportunity to catch up with our old London friends! But sometimes I really did prefer staying within our colony if only, to avoid the dreaded Mumbai traffic which had got much worse than before. Not to mention the complete lack of traffic discipline at traffic, uneven footpaths and just the pollution was enough to avoiding walking long distances. In fact our best afternoons were spent in our building premises with the children playing with their cousins, while the elders would have a nice, quiet tea. Watching them play like this reminded me of my own childhood days when play was unstructured and playdates were nothing more than playing with our gardeners or domestic helpers’ children all evening long in our building compound till it was really dark and we would all hurry upstairs waiting to be admonished by my mother! The boys also spent a lot of quality time with their grand mothers, who gave undivided love and attention to them, not to mention spoilt them with a ‘choice’ of food menu every meal, bought them gifts galore and took every opportunity to spend time and play with them everyday. 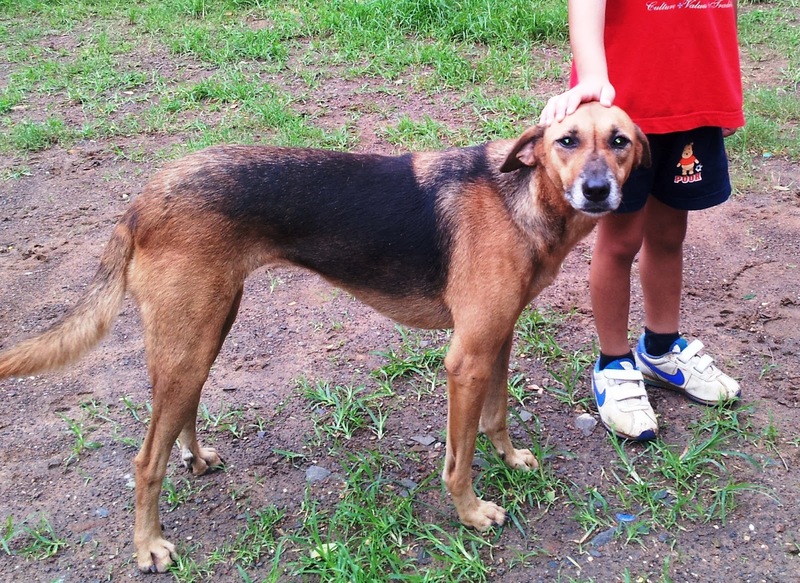 During our stay we also made quite a few doggie friends – all strays from the colony who would come to greet us wagging their tails once we became a familiar face to them. They all looked well-fed though as our Parle-G (biscuit) offerings were politely declined. We also made friends with a very pregnant but very friendly grey and white stray cat who became the kids’ source of delight and entertainment for the rest of the trip. 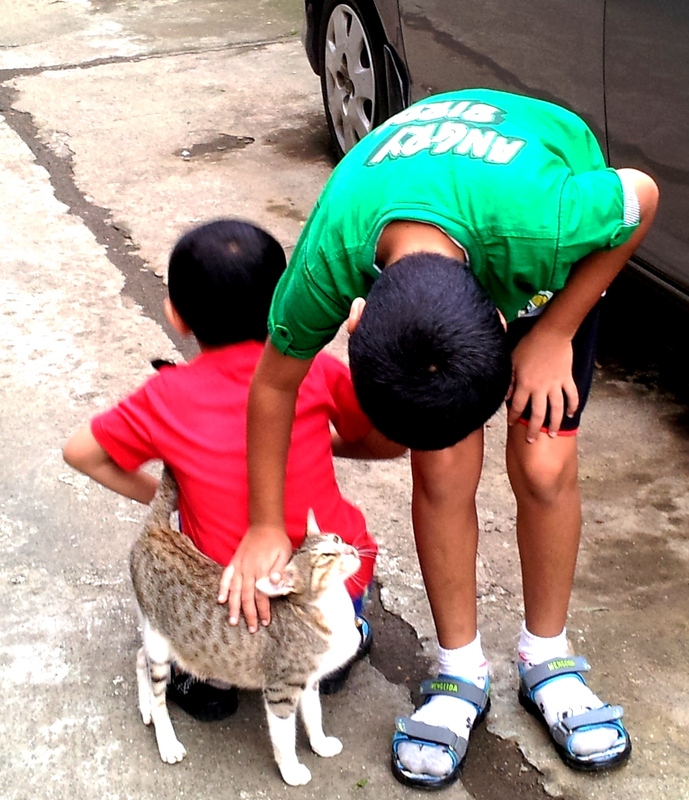 We named her ‘Kitty’ (no prizes for guessing that) and once she did not mind the kids heavy-handed petting, she looked very contended and purred along, rubbing herself across our legs. I had my bit of fun too meeting up with school friends, childhood friends, London friends, doing family re-unions, visiting old childhood places, going through old family albums and re-visiting memories. I was overwhelmed when family and friends went out of their way to make time or change their schedules to see me. I also went on an eating spree turning a blind eye to my otherwise particular diet, eating all my favourite foods – dosas, idlis, ‘chaats’ (savoury roadside snacks) whenever I could. I also had to unfortunately deal with the mundane but yet compulsory part of every trip – visiting the bank, getting my investments in place and this trip I also had a frustrating but yet intriguing trip to the R.T.O (Regional Transport Office) to secure my driving licence. 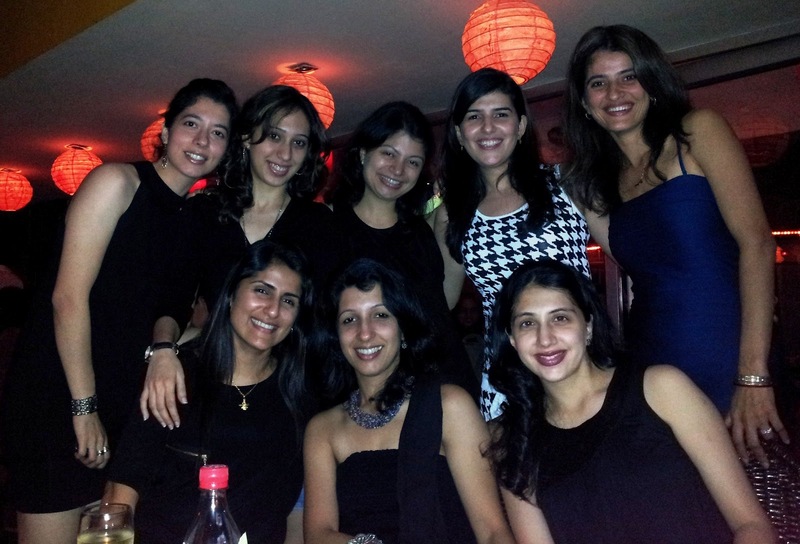 Cousins’ night out – ladies special! Time just flew by and our ‘long’ 6 week holiday ended with hasty shopping trips, family dinners, and a quick re-visit to Lonavla (my favourite hill station). But while I was feeling a bit downcast about having to say our good-byes too soon, what lifted my mood was that the boys were getting just as excited about going back to Hong Kong as they were to come to Mumbai! That’s the spirit that I really admire and envy about them and about any other children who do not waste time looking back at the past as they march straight on ahead ready for another adventure full of surprises! Yes Reena, it was 99% there, but if hubby had joined in it would have been 100% perfection!